« PRIMAL Atlanta – Would you care for some brains with your goat cheek? Most adults can remember that one dish that a member of your family used to make when you were growing up that sticks with you for the rest of your life. Maybe it was your Grandmother’s buttermilk biscuits or Mom’s apple pie. Whatever that meal was for you, I’d bet you now have a hard time finding another one like it that tastes as good as theirs did. One of the highest compliments a diner can pay a chef is “This is as good as my ______ used to make”. For me, that dish was my Grandfather’s fried chicken. When I would go visit the extended family in northern Alabama (Big ups to Florence, AL!) I would insist that he make his fried chicken while I was there. 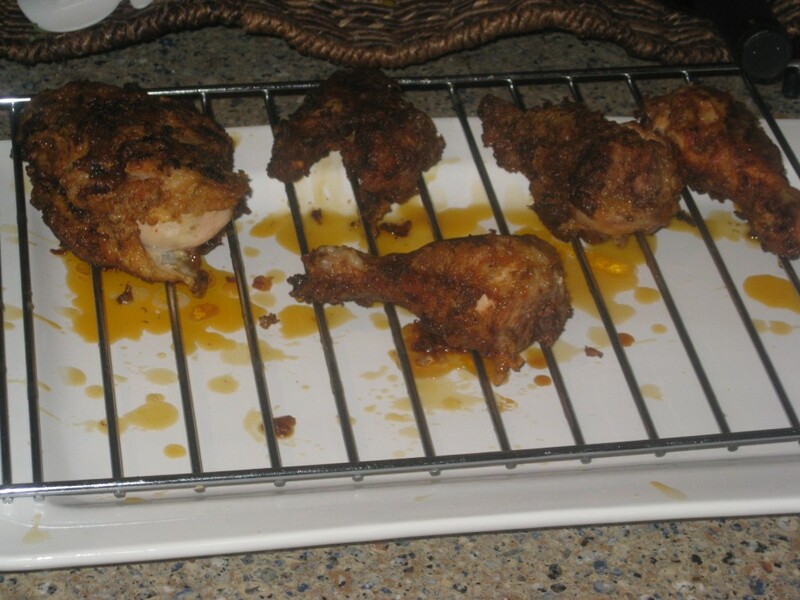 Now, I suffer no delusions that I can even come close to replicating my Grandfather’s fried chicken. Check back with me after I have had 50 years of practice. But I have gotten pretty decent at it. It is classic southern and tasty as hell. Recently, a co-worker mentioned that he and some of his buddies had made smoked fried chicken that weekend. I was flabbergasted. What is this that you speak of? I like smoking food. And God knows I like fried chicken. I think I’d like to give that a try. So, I set out to figure out how to combine two of my favorite activities….smoking meat and frying things….and this is what I came up with. The result is the best of both worlds- golden fried smokey chicken. I hope you enjoy. 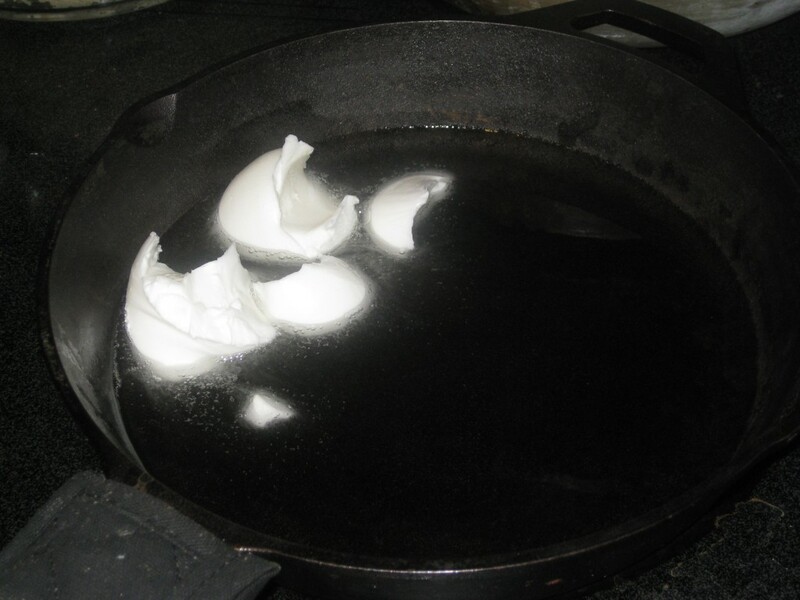 1) In order to execute this dish you will need a cast-iron skillet. 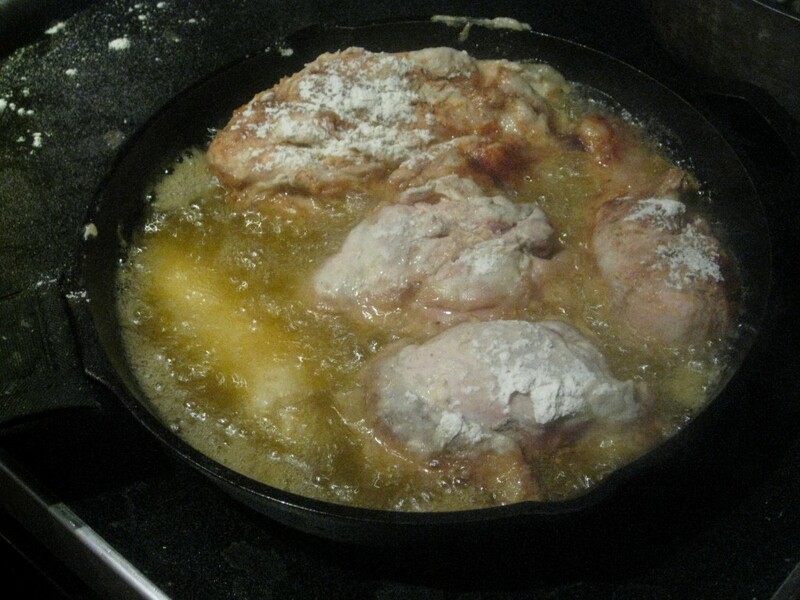 Another heavy bottom pan will work, but cast-iron is by far the best for retaining heat and getting the crust right. Besides, everyone should own a cast-iron skillet. 2) There will be no deep frying or oil involved. This recipe uses shortening. If you have never used shortening before, don’t let that freak you out. 3) You have to start this at least 12 hours before you intend to serve it. That is the minimum amount of time you need for the buttermilk to congeal properly. Otherwise, the crust won’t be right. First you must butcher the chicken. You can absolutely just buy 2 breasts/thighs/legs if you want to save yourself the work. But that is more expensive and it only takes about 2 minutes to cut up a chicken. We are in a recession people! If you have never done it before Here is a good how-to video. 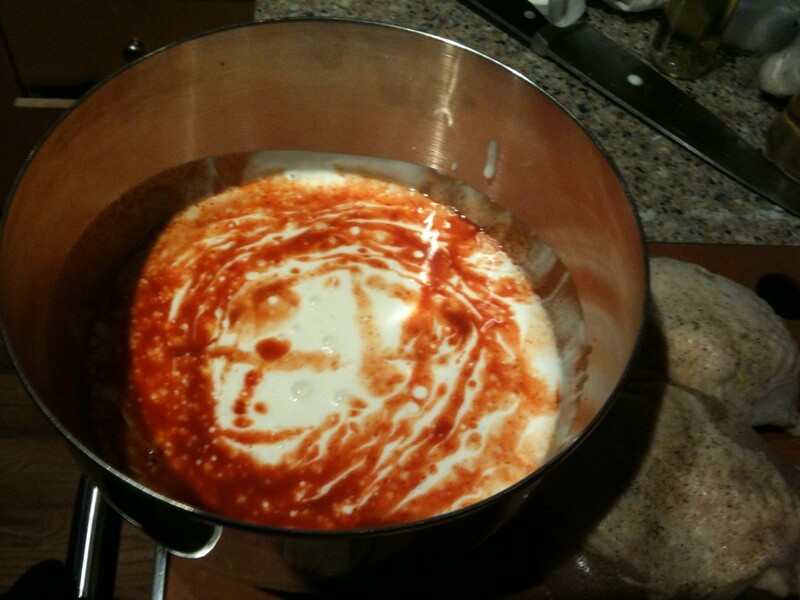 Fill a large bowl with the buttermilk and mix in the hot sauce. Add the chicken pieces and make sure to cover. If you need to add more buttermilk/hotsauce, feel free. Cover and refrigerate for at least 12 hours. 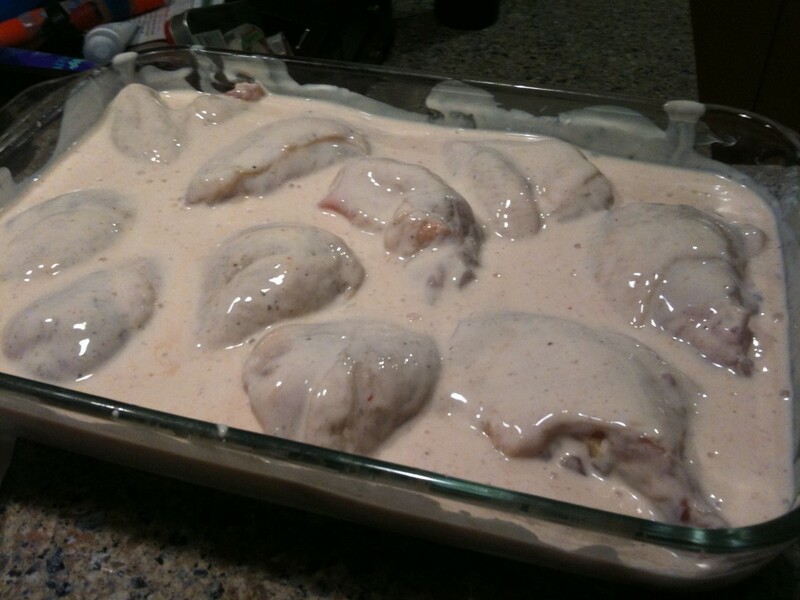 Remove your chicken from the buttermilk and drain in a colander or on a rack for 10 minutes or so. Next, prepare your smoker. What you want here is a lot of smoke and not a lot of heat, so try to stay around 200 degrees if you can. You want to infuse the smoke flavor without actually cooking the chicken. Smoke for 20-25 minutes. You don’t want to smoke the chicken much longer than that, or the smoke flavor can become overpowering. Keep an eye on your temperature to make sure you don’t actually cook the meat. 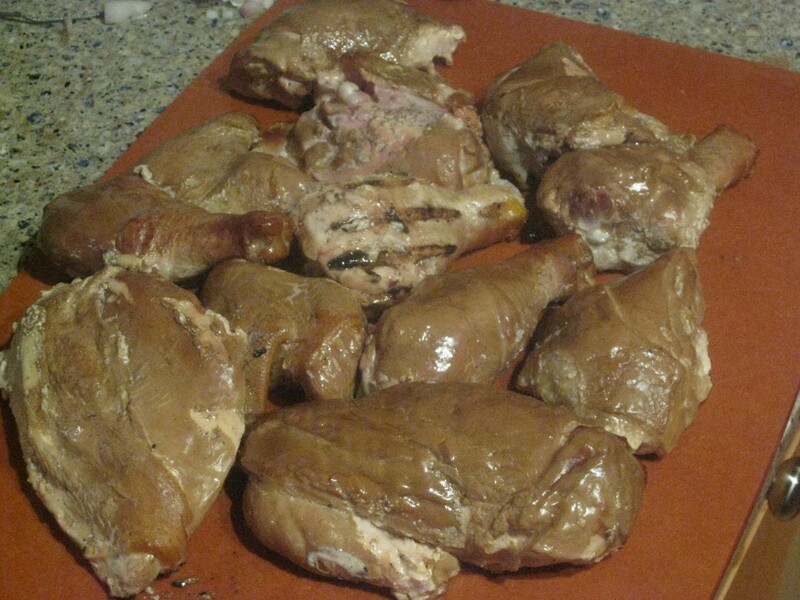 Remove the chicken from the smoker. The buttermilk coating should pick up some brown coloring from the smoke. Place back into the buttermilk for 10 more minutes. 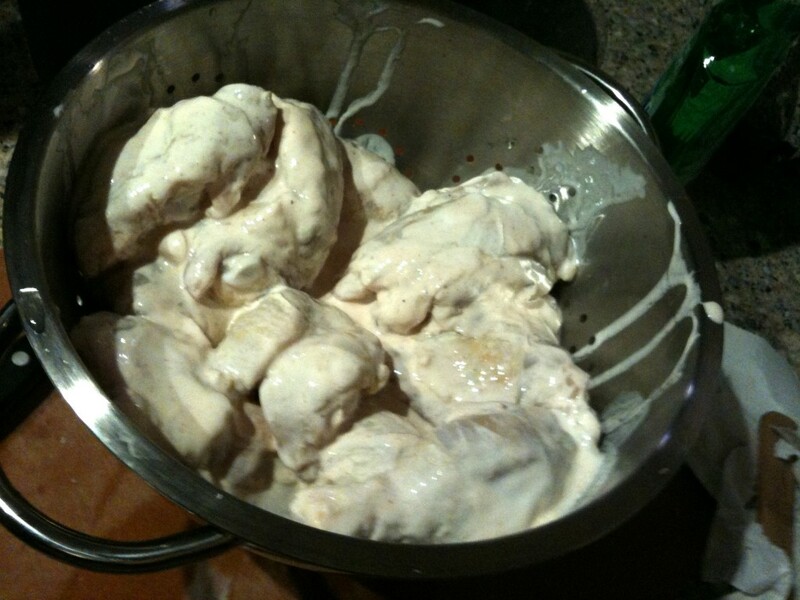 Remove and drain again.While the chicken drains, heat the shortening to 350 degrees. Mix together the paprika, salt, and black pepper and season the chicken liberally. Once the shortening reaches 350 degrees dredge each chicken piece through the flour, coating completely. 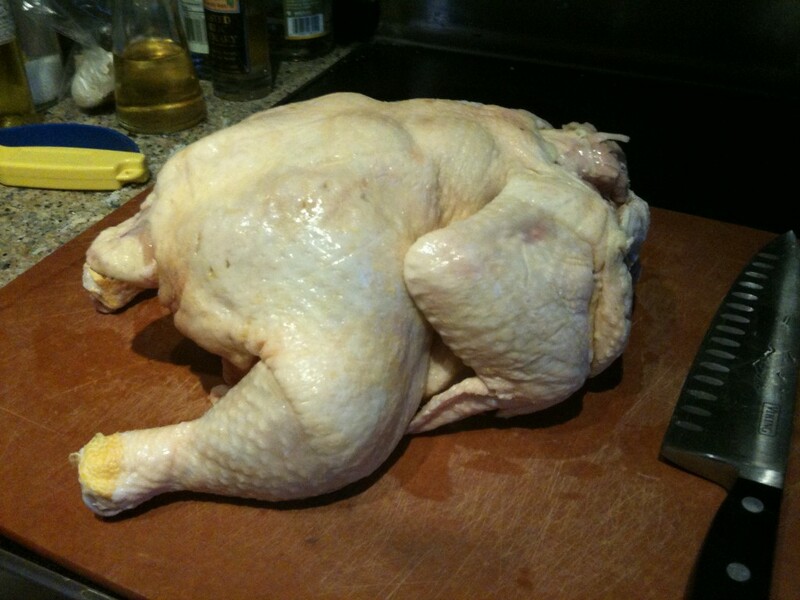 Allow the chicken to rest for 2 minutes before placing in the pan. This gives the flour a chance to set. You will probably need to raise the heat on your stove for a few minutes to compensate for the drop in temperature after adding the meat. Watch your temperature while you are cooking. Try to stay between 325-350 degrees. Fry until golden brown, roughly 8-10 minutes per side. 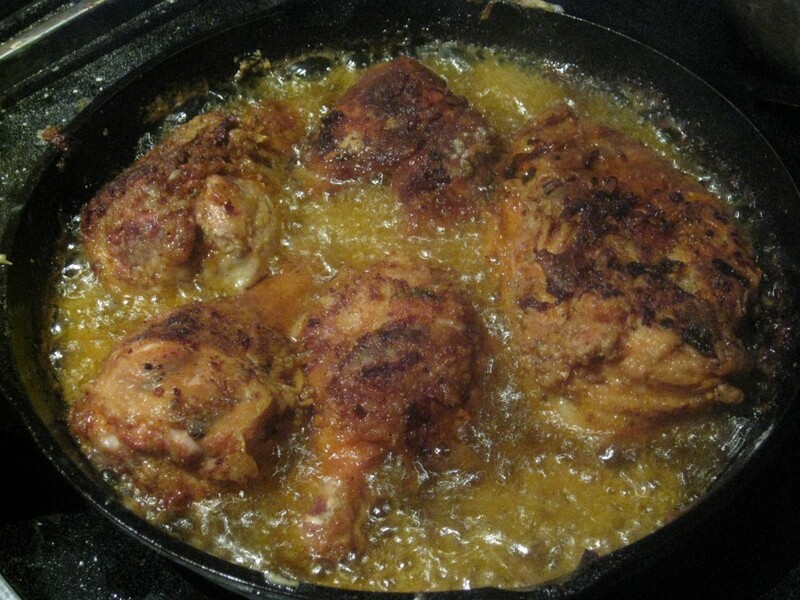 There should be a darker brown crust where the chicken makes contact with the skillet, surrounded by golden brown elsewhere. You don’t want it to be dark brown all over. Check a piece after 7 minutes or so to make sure that it isn’t crossing getting too dark. If it is, you probably have the shortening too hot. Drain the chicken on a rack. You CAN drain it on a paper towel if you don’t have a convenient rack. That is how my Grandfather did it, but a rack leaves the crust less soggy. This entry was posted in Recipes, Sunday Feasts and tagged Fried, Recipe, Smoked meat, Sunday Feasts. Bookmark the permalink. Post a comment or leave a trackback: Trackback URL. I’ve never let my chicken soak in the buttermilk long enough! Thanks for the enlightenment. Not a huge fan of smoked poultry but I’ll definitely try the frying part. If you want to leave out the smoking step, you may want to turn up the seasoning on the chicken a little more. I also just realized that I didn’t mention where to use the paprika or salt/pepper….might be important. Will edit that now…. Very interesting recipe! This is the first I’ve heard of “smoked fried chicken” and I’d really like to try it. I need to get my hands on a smoker so I can give this one a go.